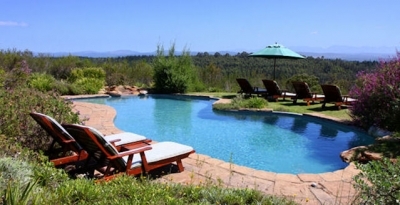 Plettenberg Country House and Cottages is set on a magnificent Fynbos reserve, with stunning mountain views. Set amongst the fragrant Fynbos, the Cape Dutch style Country House is spacious and well appointed, and the self-catering garden cottages are comfortable and secluded. Our ethos is relaxed luxury, peace and tranquility, enhanced by our friendly and professional service. We are only a few minutes drive away from pristine beaches of Plettenberg Bay, a large selection of activities and award winning golf courses. Our swimming pool is private and has the most amazing views. An exciting addition to our services is the selection of art holidays, photography and birding courses that we now offer. We are committed to the environment, and have been carbon neutral approved. To experience our award winning 5 Star accommodations, view our accommodation and rates pages - you will be pleasantly surprised at the affordability. We have 3 two-bedroom cottages and one Studio. The Studio is Virgilia is a spacious (70 sq. metres) north facing studio/apartment suitable for two guests. Situated on the first floor of the Country House, it has its own separate entrance and a balcony from which to appreciate the uninterrupted mountain views. Each spacious cottage (140 sq. metres) is well equipped, has two bathrooms, and sleeps up to 5 people in luxury and comfort. Prices are Minimum Single Rate.